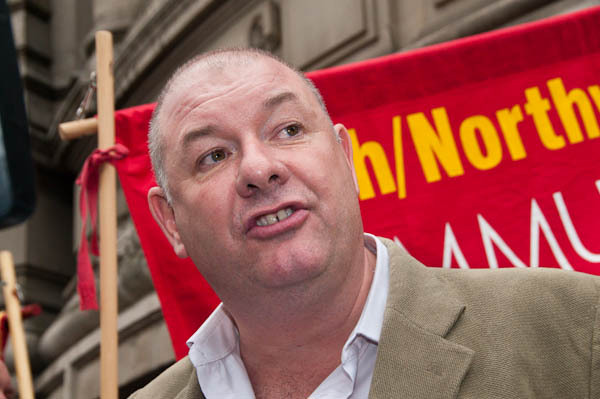 Postal workers held a rally at Methodist Central Hall in Westminster on Tuesday to protest at government plans to part-privatize the postal service. The government argue that this is necessary to protect pensions and to modernise the service, but it seems likely that any company taking over mail deliveries would only do so if the government picked up the pensions bill in any case. The real problem with the post is that earlier measures allowed private companies to cream off the easily delivered profitable parts of the service, while leaving the Royal Mail to continue the expensive universal delivery service – including the delivery of its competitors post at regulated prices. To provide a level playing field, these should have properly reflected the fact that the competitors were not required to provide a universal service. 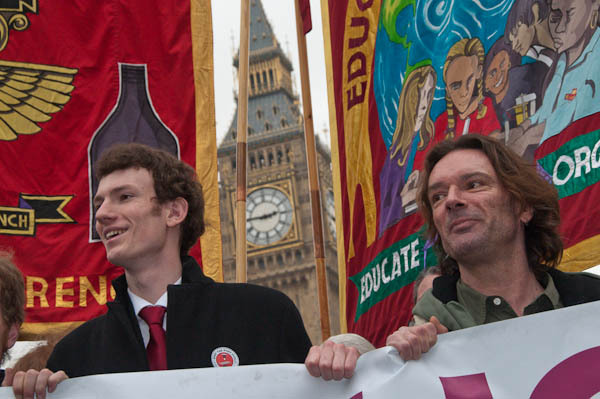 After the rally, I photographed the postal workers – including the Deputy General Secretary (Postal) of the Communications Workers Union Dave Ward, and CWU General Secretary Billy Hayes, as they came out into the street and walked down for a short demonstration in Parliament Square. 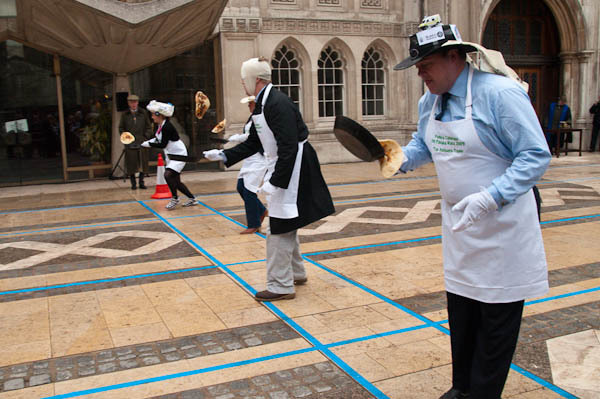 It’s a shame that the Pancake Race is unlikely to feature in the London 2012 Olympics, because it’s perhaps the one sport in which Britain still leads the world, and we seem to have plenty of talent in training. 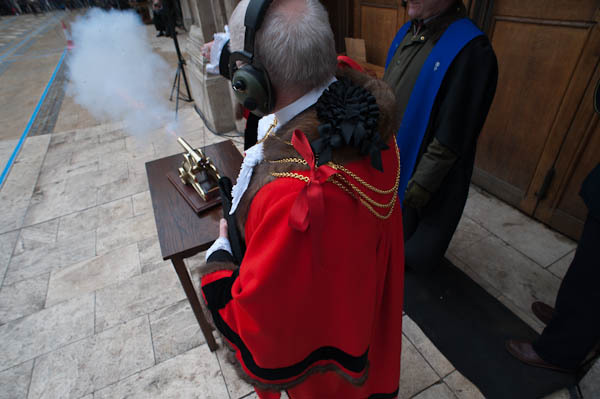 I had decided to give pancakes a little of a rest this year (and I’ve never been a great fan of eating the things) but couldn’t resist a couple of pancake-related events, the first of which was the Shrove Tuesday Pancake Race organised by the Worshipful Company of Poulters, and held – with the permission of the Chief Commoner, in the Guildhall Yard. This is a highly organised event with a large number of timekeepers and other officials, who ensure that the rules are kept and time penalties are levied for those who toss their pancakes outside the prescribed zone or fail to toss them at all, and for ladies whose dress is above the knee. This is a charity event, run in support of the Lord Mayor’s Charities, but despite a great deal of fairly reserved fun, the truly competitive nature of the city emerges in these inter-livery races. Although the rules are old-fashioned – in the masters race those taking part wear their badges and robes and skirts or dresses are required for the ladies race, the times are impressive. Photographically there are plenty of moments to catch, but two gave me a special satisfaction, though I don’t think they are the best pictures I took. The races are started using a small cannon, and I just caught the right moment when the event was started, with a flame and smoke coming from the barrel. I could have done with ear-protectors too! So although it may not be a great photograph, it is a bit like hitting a jackpot on a fruit machine, where all the dials have ended up on a pancake! The guilds are a part of our ancient traditions, but this race is only in its fifth year, and I’ve photographed three of these and put the pictures on My London Diary (and as I was taking pictures, someone said “you’re the man with the web site”.) As well as this year’s pictures, you can also see those from 2008 and 2007. 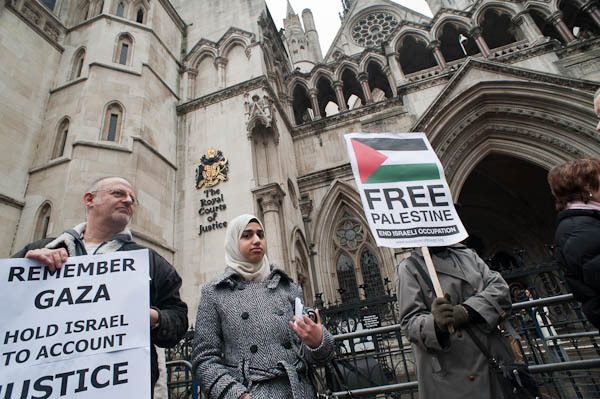 The Palestinian human rights group Al-Haq filed a claim for judicial review before the High Court of England and Wales on Tuesday challenging the government’s failure to fulfil its obligations with respect to Israels activities in Palestine. They call upon the government to publicly denounce Israel’s actions in Gaza and in the continuing construction of the wall, to suspend arms related exports and government, military, financial and ministerial assistance to Israel and to UK companies exporting arms and miliatary technology and to insist the EU suspends preferential trading with Israel until that country complies with its human rights obligations. They also ask that the government should give the police any evidence of war crimes committed by any Israelis who intend to come to the UK. 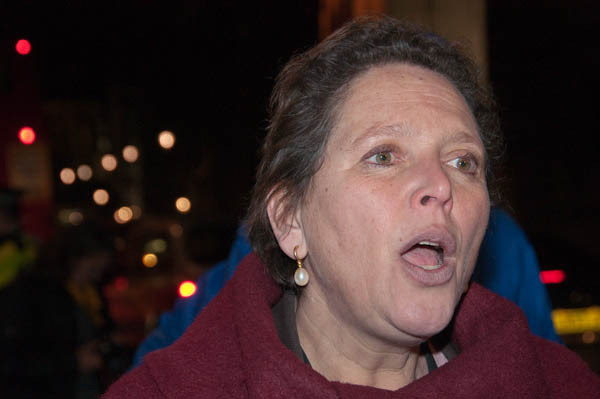 A small group of demonstrators were outside the court to support the application on Tuesday and a press conference was held including solicitor Phil Shiner of Public Interest Lawyers (PIL) and Gaza Legal Aid Fund trustee Mary Nazzal-Batayneh. There were two demonstrations starting at 5.30 in Westminster, so it seemed a good occasion to try out the Nikon D700 at high ISO working with available light, though I also took some flash pictures with the D300. As the light fell, I started working at ISO 2000, and this shot at 1/60, f4 with the Nikon 20mm f 2.8 is very usable, although my normal Lightroom settings for noise reduction left a little colour noise on 1:1 viewing – easily removed by a small increase in the ‘Color’ setting from 11 to 15. There was also visible luminance noise, improved slightly by increasing the setting for this, although it wasn’t possible to remove it completely. Most frames taken at 3200 were actually a little cleaner, suggesting that despite shooting on RAW, in-camera noise reduction is kicking in more strongly. Although there is a little noise, the overall quality is remarkable, and these images are fully usable. I wouldn’t anticipate having any problems even with the occasionally rather pernickety quality control on sites such as Alamy. The noise is actually quite attractive – rather like film grain – so long as you remove the colour component. 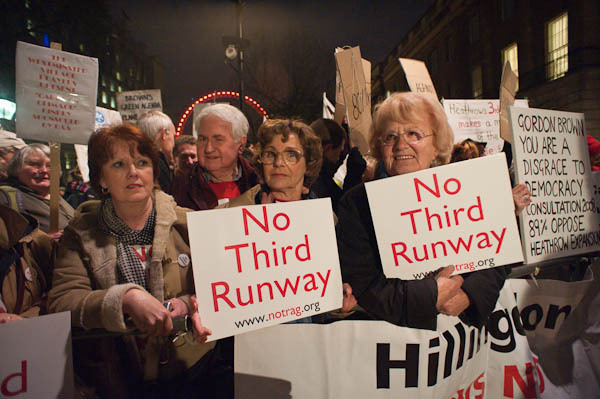 Here is a picture of two NOTRAG supporters in Whitehall, taken at 18:15, 1/80 f4.5 ISO 3200, again with the 20mm. In fact I suppose it is really at ISO 6400, as to keepthe highlights (except for actual light sources) I had to use a -1 EV exposure bias. There is some noise visible, and a slight lack of detail compared with a low ISO picture, but overall the quality seems very usable. And in the city centre, ISO 3200 lets you shoot hand-held in available light, certainly with wide-angle lenses. Here are a few pictures I took later in the evening. This last image shows what is now sadly the former Eurostar terminal at Waterloo (St Pancras may be fine for some, but the switch there and the huge sums spent on the high speed line from Kent to there have increased my journey times to Paris by on average 15 minutes.) And it’s a little of a cheat as a hand-held image because I was resting my hand holding the camera on a nice solid wall for the 1/6 second exposure. But the roof detail is great at the left of the picture. Surprisingly for a 20mm image it seems not to have sufficient depth of field to retain sharpness to the end of the structure. So a tripod would have been a good idea, allowing me to stop down and give a longer exposure, and doubtless the lens would also perform a little better stopped down. And it might even have been improved slightly by using a lower ISO. Flash still has a big advantage in taking portraits in the street at night because of the poor colour spectrum of most street lighting, which makes it impossible to get normal skin tones. But I can see that on the D700 I shall be shooting flash at higher ISO to, to retain more of the surroundings. I think of the modern movement as an interesting historical time in art and architecture, exemplified in architecture by the work Le Corbusier (I hope to see the show about his work at the Barbican shortly), by the painting of Picasso, the photography of Strand and Weston. For all it’s new ideas and appeal at the time, it now seems curiously outmoded, dated perhaps even more than some of the work that preceded it. 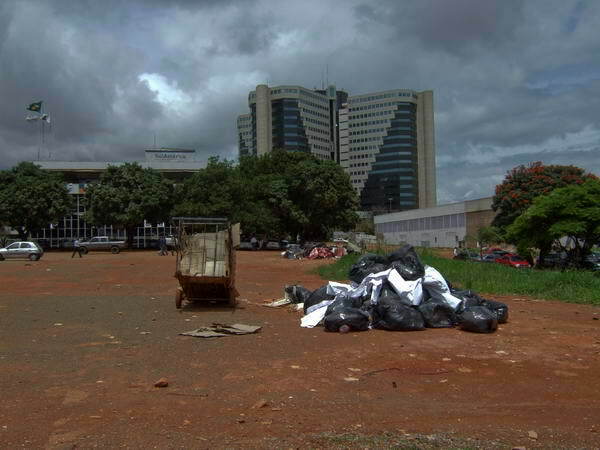 Perhaps it’s last great exemplar in urban design and certainly one of its grandest was the new city of Brasilia, which I was fortunate to have the opportunity to visit in December 2007. 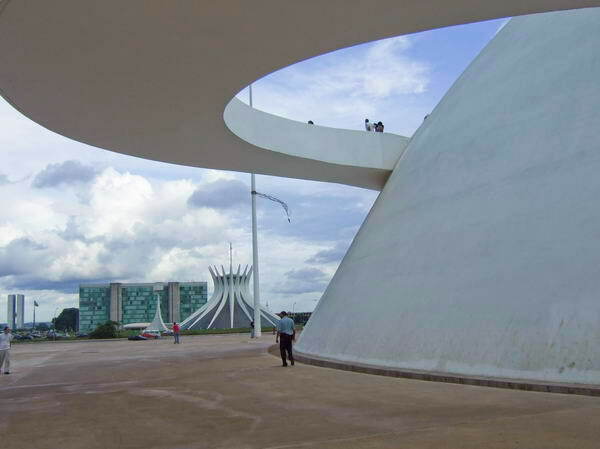 The planning of Lucio Costa and the concrete poetry of Oscar Niemeyer is certainly breath-taking, but it is a future vision with some very obvious cracks around the edges. Modernism was certainly an interesting experiment, with lessons that continue to inspire, but not a model to follow. Rather than think in terms of machines for living we have perhaps moved more towards the idea of organisms that have to live together in an environment as a central theme. So the so-called ‘Modern Movement‘ (MM) set up by those associated with the old ‘Revolutionary Communist Party‘ is perhaps an appropriately named dinosaur, based on the outworn dogma of extreme free markets. 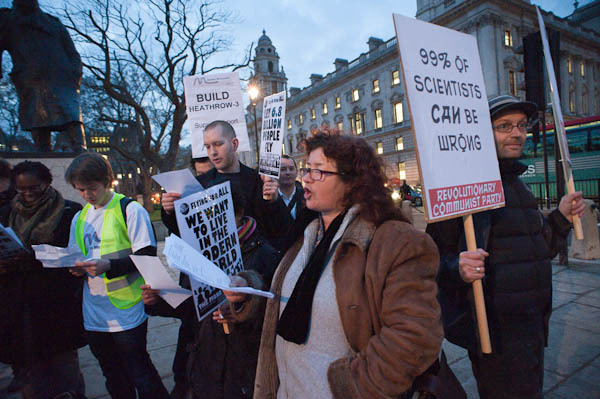 On the evidence of Thursday’s demonstration, with around 20 people in Parliament Square, it is also a very small and poorly supported dinosaur. 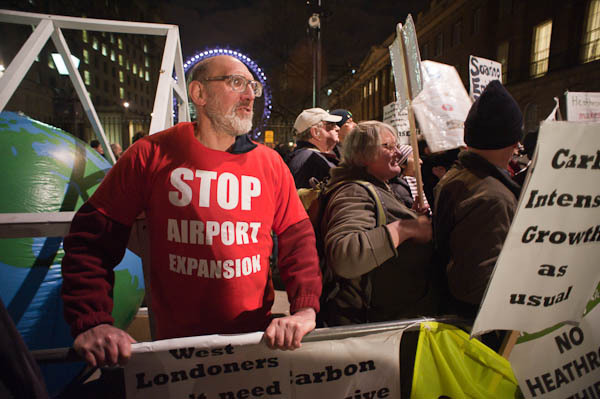 By contrast, perhaps fifty times as many were demonstrating against the building of a third runway at Heathrow just a few hundred yards away on Whitehall. 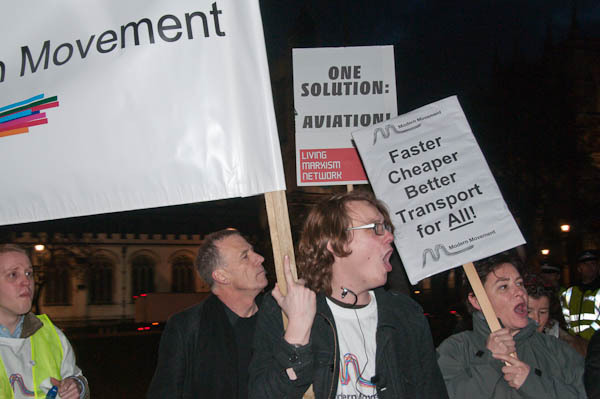 The intervention of a just a small handful from ‘Plane Stupid‘ who came to join in with placards that expressed in simple parody the ideas of the MM was effective beyond their numbers, and clearly linked the demonstration to the ‘Living Marxism Network‘ and the ‘Revolutionary Communist Party‘. 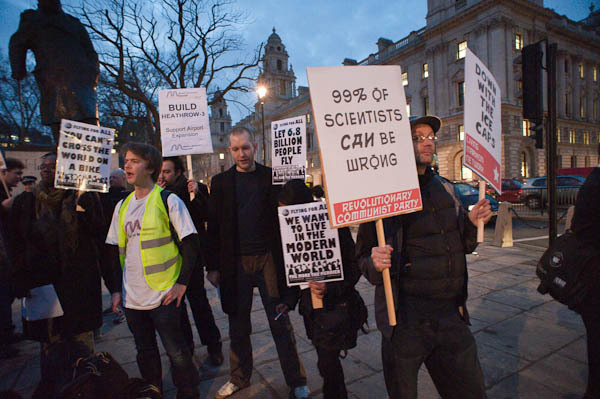 Their placards read ‘One solution: Aviation!‘,’Down With the Ice Caps‘ and ‘99% of scientists can be wrong’, and their very presence caused a minor security alert across the whole of government offices in central London. One of the co-founders of MM, Alex Hochuli said in a TV interview (on Worldbytes, an internet TV station that seemed to have a connection with the demonstrators) : “the ability to travel, to see the world, to work abroad, to live abroad, to have other people come here is more important than dealing with climate change.” There you have it. This is what their protest was about. The planet can go hang just so long as a few of us in the rich world can have cheap air travel. 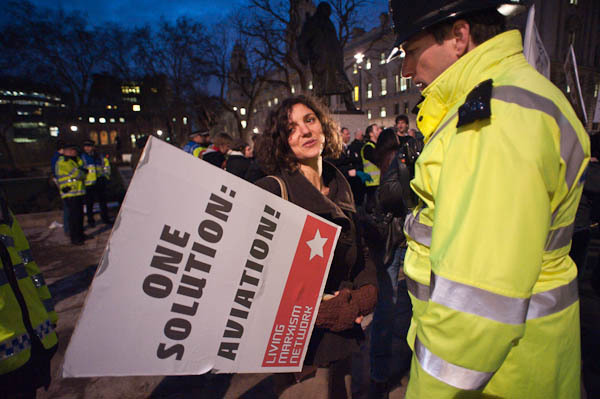 On the square, police and MM stewards attempted to stop Plane Stupid protesters taking part in the demonstration (see comment – I may well have misinterpreted the reaction of the MM stewards.) The police gave a warning that they could be prosecuted for taking part in an unauthorised demonstration in the SOCPA area, while they insisted they only wanted to take part in a publicly advertised and authorised demonstration. While one man slipped apparently unnoticed onto the end of the short line of protesters and stood there for around half an hour before police finally removed him, a woman was prevented by police from taking part for most of the time I was there. You can read more about the history of the RCP and the organisations associated with it on Lobby Watch although this has not yet been updated to include ‘Modern Movement’. 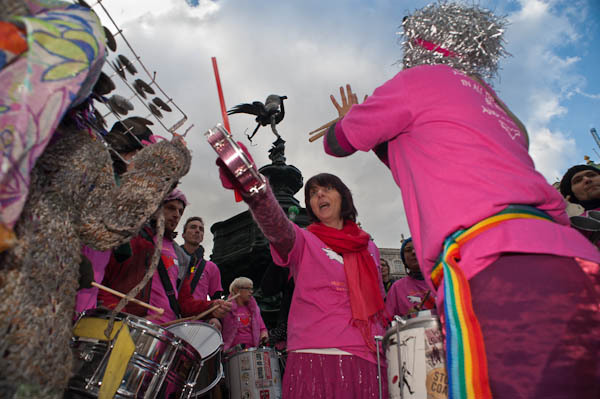 There is more about this event on My London Diary with more pictures of those taking part. There were I’m afraid no surprises at tonight’s opening of the show of the four shortlisted for the Deutsche Börse photography prize at the London Photographers’ Gallery, except that the wine ran out before I had got a second glass. His pictures of the park taken over twenty-two years, although very highly praised by some, have to me the air of an amateur, little slices of life, observations of little consequence. Immaculately presented, they are printed with a curious tonality that renders flesh more as cold porcelain than living flesh or anything with warmth or humanity. It looks somewhat better on the web than on the wall partly because the tones are more normal there, but also because the large prints seem to to emphasize the vacuity of some of the images. Papageorge has produced some interesting books, notably that showing the similarities in the major works of Walker Evans and Robert Frank, American Photographs and The Americans, arguably the two most important American photography books of the twentieth century. The selection of images on show here did nothing to improve my view of his photography. Papageorge is highly regarded as a teacher, and definitely is a great promoter of his students and former students, but as a photographer he has always seemed an also-ran. Paul Graham‘s work from the book a shimmer of possibility, described somewhere on the wall as ‘haikus’, lacked any photographic coherence so far as I was concerned. A haiku is perhaps a form that creates an instant flash of recognition, a seventeen mora that create an image, a single moment. Here we had stilted, repetitive and poorly exposed frames that to me resembled more the stuttering of a partially sighted person with severe learning difficulties. The programme notes describe them as photographic short stories, but I don’t feel they had a story. Frankly I could see no value at all in these works, although some of Graham’s earlier work – such as his Beyond Caring (1984-85) still appeal. The work of Emily Jacir is interesting but seemed to me to have no place in a photographic gallery – as the gallery notes clearly state, hers is the work of an archivist, activist and poet. Not a photographer. On display were the notes and the artifacts collected by her in a study of the assassinaion of Wael Zualter, a Palestinian intellectual assassinated by Israeli secret service agents in ROme in 1972. These include a letter written by Alberto Moravia recommending him to to Jean-Paul Sartre, and another handwritten list of the Mossad agents involved in his assassination. Is it’s inclusion here a suggestion that we should all abandon photography entirely? Like those Camera Clubs that turned over to bicycling when the photographic craze abated? For me the outstanding work of the four finalists came from Taryn Simon, whose ‘An American Index of the Hidden and Unfamiliar‘ gained the 2008 Infinity Award for publishing from the ICP, and was one of the few decent shows to grace the Photographers Gallery in recent times. In the unlikely event that I was a member of the panel deciding on the winner of the DB prize, a short walk around the gallery would have convinced me to sidestep the four shortlisted choices and award it instead to Guy Tillim, not actually for the few of his large prints on the wall but for the book of them, Avenue Patrice Lumumba. 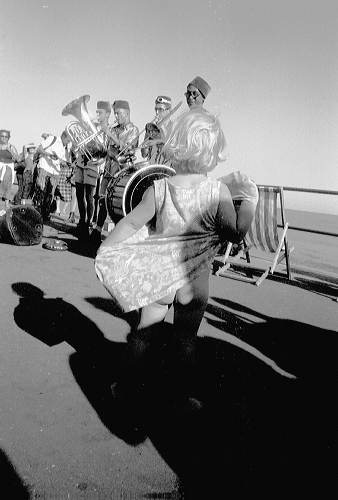 This work is currently also on show at the Fondation Henri Cartier-Bresson in Paris and will also be shown at Foam Photography Museum in Amsterdam and the Serralves Museum in Porto, Portugal, and looks a very likely candidate for next year’s Deutsche Börse prize – assuming the bank stays solvent. But I hesitate to make predictions as to who will win, given the fate of those I’ve tipped in previous years. 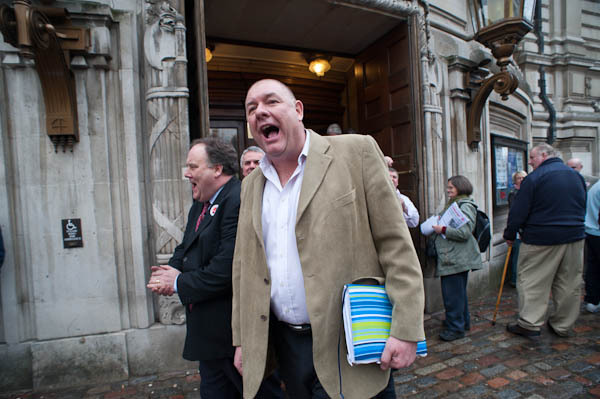 If the prize was to be awarded on the basis of the photography on show, for me Simon would be the only choice. But Jacir has politics, and the Palestinian situation very much on her side – despite the fact she isn’t a photographer. Papageorge is undoubtedly the biggest name in the world of photography among the four, even if not largely known for his pictures. Graham seems too dark a horse to even consider. But I won’t be making any bets. 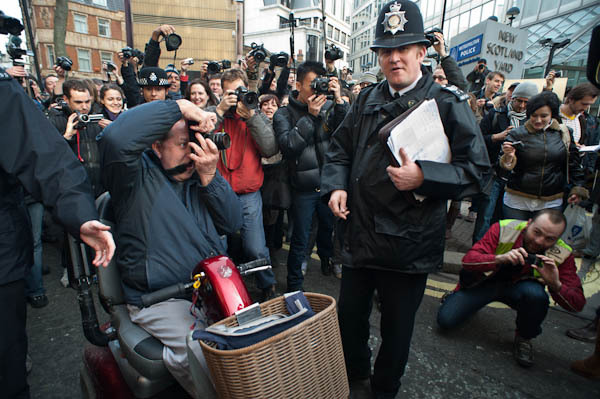 Photographers increasingly feel threatened when they take pictures on the public street. Sometimes they are actually threatened, both by vigilantes and by the police – and like most others who work on the streets, its happened to me. 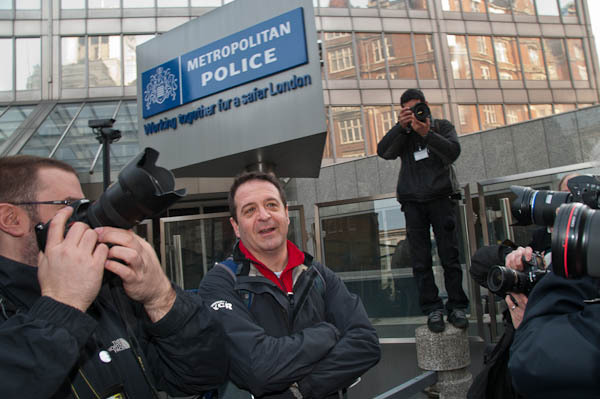 The police have even run a poster campaign against photographers – and in March last year NUJ General Secretary Jeremy Dear staged a one-man protest at New Scotland Yard to defend press freedom and the rights of photographers. Previously the NUJ and other journalistic bodies had agreed guidelines with the police about how police and press should work together, but these seldom seem to respected by the police. You can read more about the issues and the event in the >Re:PHOTO blog post ‘Photographers by the Yard. Previously much of the legal friction between police and photographers had been over the wide-ranging powers of police under Section 44 of the Terrorism Act of 2000, which allows them to stop and search anyone within a designated area. The whole of London is one such area, and the powers, intended to be in force for a maximum of 28 days, are renewed indefinitely. Monday’s demonstration – or rather ‘media event’, since it took place in the SOCPA designated area – was a rather larger event, with an estimated 400 professional and amateur photographers, and was organised by a small group of photographers to mark the introduction that day of Section 76 of the Counter-Terrorism Act 2008. It is now an offence to photograph any policeman, serviceman or intelligence agent in a way that is “likely to be useful to a person committing or preparing an act of terrorism,” or to publish such a picture – for example on a web site such as this. You don’t have to be a terrorist or to make use of your picture for any terrorist purpose. If a court can be persuaded your picture might be of use to a terrorist, you can get 10 years in jail. It is the kind of law that a few years ago we would have shrunk with horror at as clear evidence of a police state. At the moment although we are lurching dramatically in that direction, our courts do usually provide some protection, and the law does give them some power in it’s statement: “It is a defence for a person charged with an offence under this section to prove that they had a reasonable excuse for their action.” It is perhaps hard to imagine – at the moment – a court convicting a journalist covering a demonstration for photographing the police. But rather easier to imagine it being used – as with Section 44 – by police to harass photographers and prevent them from getting on with their job. Being held and searched for 40 minutes while on the way to cover an event can be a pretty clear interference with the freedom of the press to report. More about the event and more pictures on My London Diary. 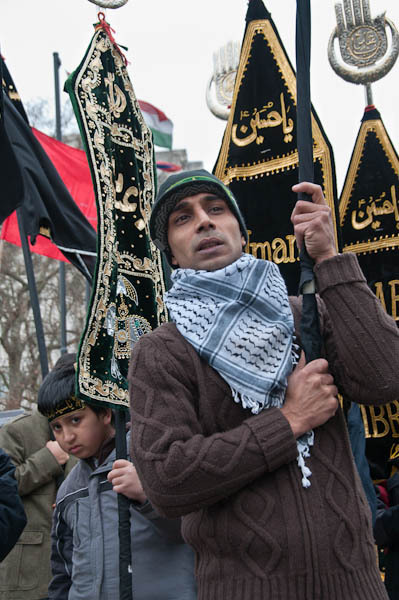 An Arbaeen procession has taken place in London every year since 1982, and it is a moving and colourful occasion in which several thousand Muslim men and women take part. 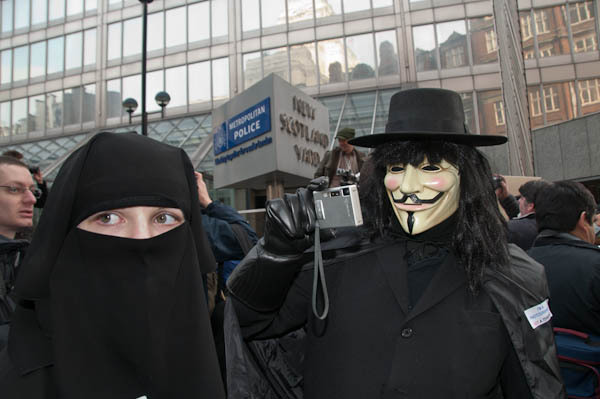 After prayers and speeches they processed along Park Lane chanting and beating their breasts as a symbol of mourning. While for most this is simply a symbol of their deep feelings of mourning, for some it has a powerfully physical aspect as well. 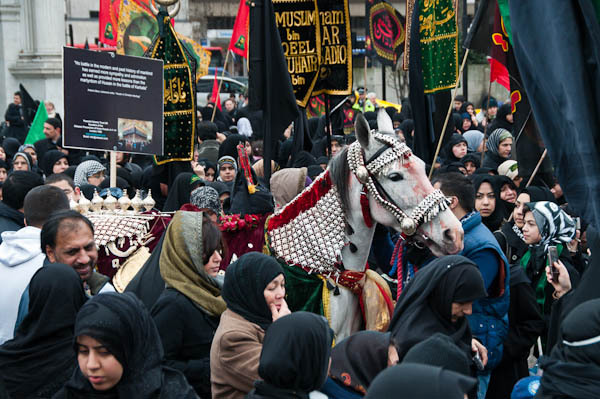 In the procession were two large intricately carved metal models of Holy shrines (Shabbihs) the cermemonial horse (Zuljanah) of Imam Husain and the cradle of Hazrat Ali Asghar, who only six months only was the youngest martyr at Karbala. There were also many standards, flags and banners. Last Saturday was St Valentine’s Day. My French calendar also informs me that it was also the day for St Cyrille and St Methode (is this a takeover bid for John Wesley?) but I’ll pass on them. 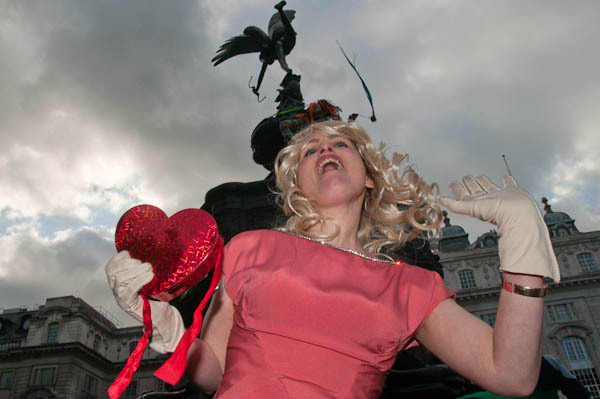 Traditionally St Valentine’s day has become a great merchandising opportunity in which large hearts fill the windows of shops and the pockets of shop-keepers. 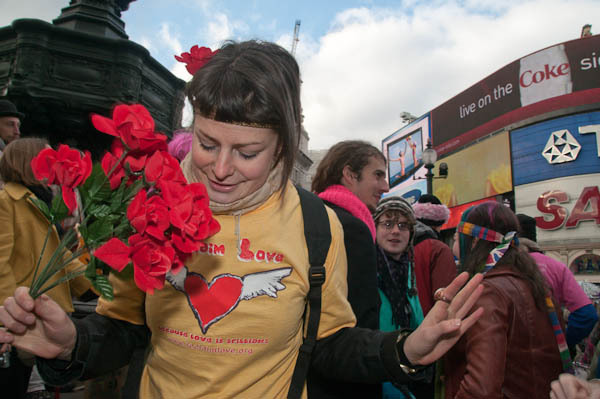 Reclaim Love, now in its sixth year, sets in opposition to the commercialisation of this festival of love. 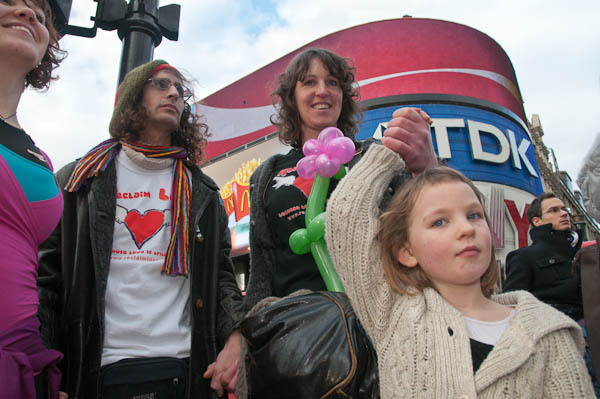 Everything is free – including several hundred free t-shirts, free hugs, free food, music and being together and enjoying each other’s company. Love comes free and it is the greatest force in the world is the message behind this annual festival organised by – who else – Venus. And it’s an event that is spreading around the world, with Reclaim Love events this year in countries including Iceland, Finland, Spain, Italy, India, Pakistan, Australia and elsewhere. 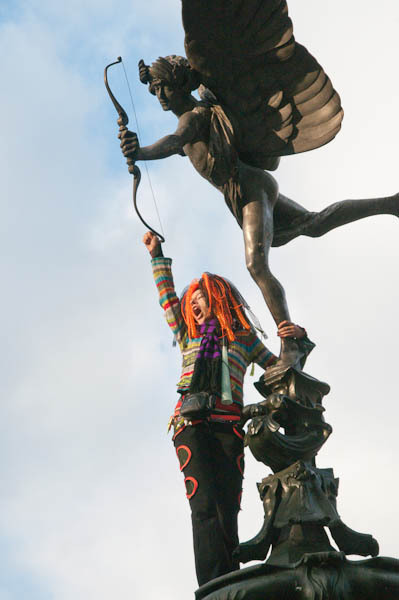 At 3pm, Venus organises everyone present to hold hands to form a large circle around the whole area, rushing herself to join it and send out a message of love to the world. And then the partying continues under the statue of Eros. 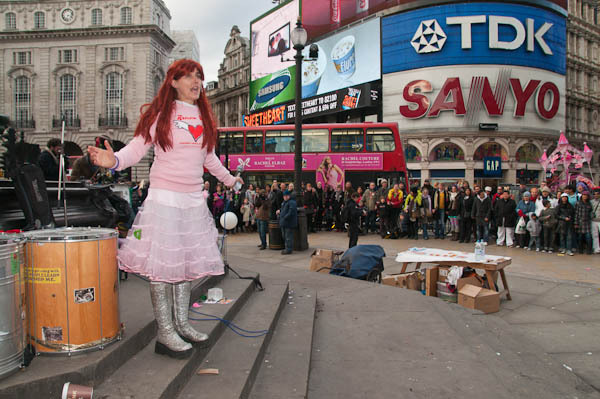 More about the event and more pictures on My London Diary, where you can also see pictures from some previous years – 2005, 2006, 2007 and 2008. It was with great regret that I heard this morning of the death of Peter Goldfield who gave so much to many photographers through the workshops he ran at Duckspool as well as his own photography and teaching at various universities over the years. He was a clever and kind man who was always a pleasure to meet and although I’ve seen him only infrequently over the years I’ll miss him; it is a great loss for photography in the UK, and of course much more so for his family and close friends to who I extend my sympathies. I first came across Peter, like me a Londoner born in 1945, in the room above his pharmacy in Muswell Hill in the early 1970s. Goldfinger Photographic was for many of us an introduction to ideas of fine printing particularly with the publication of the Goldfinger Manual, and perhaps more importantly was the source of that Holy Grail for fine printing, Agfa Record Rapid, imported specially by Goldfinger and not otherwise available in the UK. A couple of years later I met him briefly at his home nearby and was introduced to his family before being driven by him to a workshop – I think it was with Lewis Balz – at Paul Hill‘s Photographers’ Place in Bradbourne, Derbyshire. It wasn’t the first visit there for either of us, and it was a place that played a vital role in both of our lives, particularly pivotal for Peter. It was perhaps surprising we hadn’t met there before, but we found we knew many of the same people and similar ideas, as well as appreciating many of the same photographers. For him the forming experience had been a workshop with Charles Harbutt, while for me a series of meetings with Raymond Moore made a lasting impression. I went to two workshops at Duckspool, where Peter and his wife Sue were splendid hosts, and have happy memories of both. One was with Charles Harbutt, and it was indeed a memorable and thought-provoking experience; perhaps had I met him 20 years earlier it would have changed my life too. 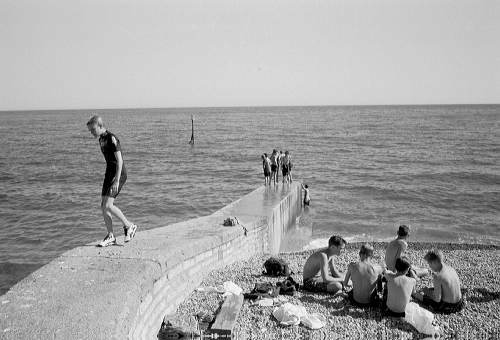 The second, in 1998, was with Leonard Freed who I warmed too rather less, but it was great to be at Duckspool again. I wrote an article about the experience for a small magazine I was editing at the time, London Independent Photography’s LIPService, and I’ll reproduce here most of the text from that, as well as the pictures from the workshop I used to illustrate it. I hope it will bring back some fond memories to some of my readers as it does to me. Readers who have yet to make it to Duckspool are missing one of the more rewarding and intensive experiences available to the photographer. The chance to work with one of many well-known photographers (including John Blakemore, Mark Power, Martin Parr, Homer Sykes, Fay Godwin, John Davies, John Goto from this country and distinguished visitors such as Judy Dater, Susan Meisalas and Charles Harbutt) as well as the other keen and often very talented photographers who are your fellow travellers. Your only difficulty is in chosing which workshop to attend. Probably the best advice is to read the workshop descriptions very carefully and to talk to as many people who have already The best-known photographers are not always the best teachers so you may get better value from some of the less familiar names. 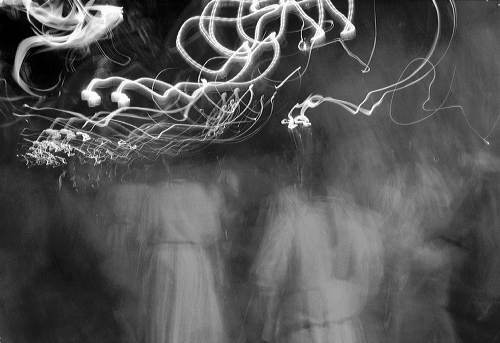 One workshop I’d recommend from personal experience – and I know has changed some people’s lives radically – is Charles Harbutt’s. (Peter Goldfield went to it at the Photographers’ Place and decided to sell up his business and found Duckspool!) One of the first photo books I bought was Harbutt’s Travelog published by MIT in 1973. Since 1986, Peter and Sue Goldfield have opened the doors of their rural Somerset home to photographers with some 25 workshops this year – and you really are made to feel at home. The accommodation in shared rooms is comfortable and the food was even better than when I last visited some five years ago, which takes some doing. However possibly not every workshop will have a meal cooked by a visiting French chef and enjoy one of the best pub meals I’ve had, but the Goldfield standard is in any case a hard one to beat. I’m told the darkroom is much improved since my last visit, although I didn’t use it, with developing and contact printing being done expertly by the artist in residence (thanks again Julia! ), leaving us more time to talk photography and take pictures (we photographed Sidmouth, then in the throes of its annual Folk Festival – reducing the average age on its streets by a factor of at least three – which climaxed with a torchlit procession to the sea).Some people also made use of Peter’s expertise in the digital darkroom, with interesting results. My only regret was having to leave Duckspool at the end of the workshop (worse, a little before the end, as I had a train to catch) as there was so much more I would have liked to have done and said. And the food! You are currently browsing the Re-photo blog archives for February, 2009.